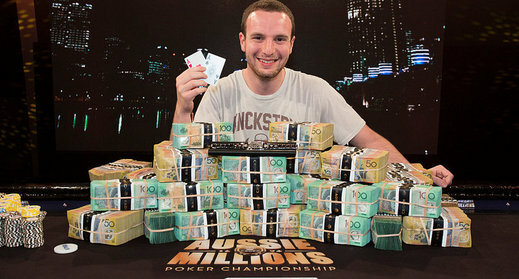 Canada’s Ami Barer emerged victorious in the 2014 APPT Aussie Millions $10,600 AUD no-limit hold’em main event. The 22-year-old topped a 668-player field to earn his first major live title, the $1.6 million AUD ($1,432,800 USD) first-place prize and 2,100 Card Player Player of the Year points. As a result he has been catapulted into third place in the overall POY race standings. Barer topped a tough final table that featured the likes of Scott Seiver (7th – $152,235), Darren Rabinowitz (4th – $402,975) and Jacob Balsiger (3th – $582,075). 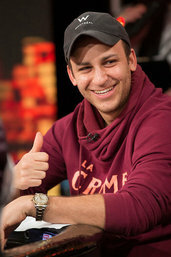 In the end it came to a heads-up battle with fellow Canadian and 2010 Aussie Millions main event third-place finisher Sorel Mizzi. Barer held just over a 2-to-1 chip lead when heads-up play began, and he was quickly able to extend that lead before the final hand arose. Photos courtesy of Shannon Morris / 2014 Aussie Millions Poker Championship.